Airlines and Hotels have made it a big business to create loyalty and reward programs for their customers. In fact, it's the most lucrative program for many companies as it brings in repeat customers who then encourage others to use their product or service. At Rewarding Travel Consultants, we work with you and these programs to maximize the number of miles and points you can earn toward travel. Not only can we help you earn miles towards that flight to Italy, but we'll also lay out how to get your hotel stay covered, recommend the best "local" restaurants, and even book your excursions for you. You'll always receive recommendations based on feedback from your booking agents and other clients as we are not paid commission by hotels and restaurants for our services. The easiest way to earn your miles requires you to sign up for a miles or points earning credit card. We never need any of your information as you'll do this process yourself. Our job is to simply provide you with the best offers (some are unlisted) and walk you through the process of receiving those miles. We do present offers that do not require getting a new credit card if that's more your speed. If you have questions about this process, please read our FAQs or email us at frances@rewardingtravelconsultants.com. Upon purchase, you will be sent a brief questionnaire asking for your basic spending habits and credit card history over the last 12 months. No balances or card numbers are needed; we simply use this information to match current bank offers to your monthly budget. 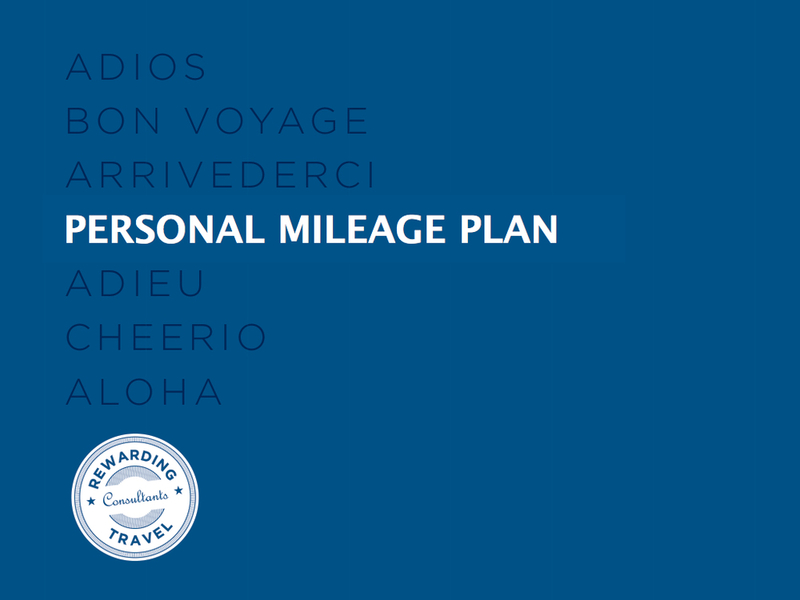 From there, you'll receive a personal mileage/point plan based on the criteria you gave us. We then walk you through each signup process, give you helpful hints and tricks to meet your mileage goals and will even book your trip for you with those newly earned points. Do I have to sign up for credit cards in order to earn miles? While it's possible to earn miles without using credit card bonuses, it is much more difficult and time consuming for you as the client. We have found, through countless hours of research, that the most effective way to get you to your destination is through credit card signups. Rewarding Travel does not provide personal affiliate links so we do not get a kickback from the companies we recommend, ensuring you receive the best offer for you, not us. Won't this hurt my credit? This is the most common question we receive. Your credit score is based on how WELL you handle credit, not if you open or close cards. Your score will most likely be affected in the short term, but we have found that it's usually only by a few points, and over a longer period of time, your score will actually increase if you learn how to manage your new card appropriately. 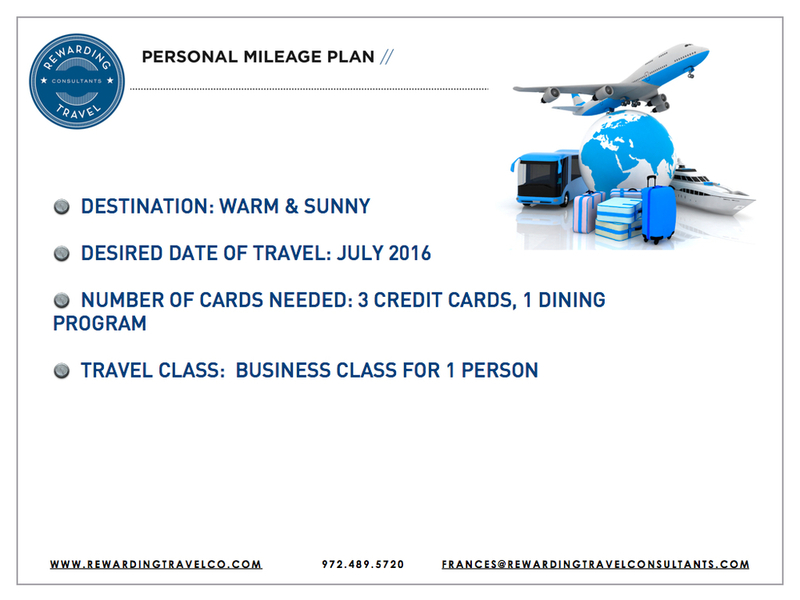 Rewarding Travel is not liable for any adjustments made to your credit through our plans. What happens if I'm declined on a card you recommend? When you purchase a plan, we ask that you honestly fill out the questionnaire prior to payment. By doing this, it helps us recommend the cards that we believe you may be approved for. We cannot guarantee approval for any card but providing us with the most accurate information will minimize the risk of decline. Please remember to list any and all cards you have had in recent history as some banks do not allow customers to hold the same card type within a specific time period. How long does it take to earn the miles? This depends on the bank you are using and your spending habits but generally it takes between 2-6 months to earn the miles needed for a single trip. Do you guarantee you can get me where I've requested? Nothing in life is guaranteed. We will do everything we can to get you to your destination of choice, pending travel bans or restrictions. If at anytime you, or we, feel that we cannot get you to the destination you wish to visit, we will happily issue a total refund. What if I don't see the type of plan I need? Can you create a custom plan for me? Absolutely! Please select the custom plan option and we will work together on a custom quote for you. This includes round-the-world trips, sabbaticals, and multiple destination vacations.